Russia’s recent deals in the Middle East aren’t just about expanding its influence, they’re part of a larger strategy. Rosneft is deploying its preferred long-term prepayment model to political effect in Kurdistan and Libya, distributing risks between producers and consumers and taking advantage of its access to state money. That model has also earned it closer ties to trading houses like Glencore and Trafigura. The firm applied the same approach to securing a customer for its Venezuelan production—another risky market—in India with its acquisition of Essar Oil. Rosneft has shown a growing commitment in tandem with Glencore to expand activities in markets where other firms have shown greater caution. While tempting to assume the narrative that these moves are primarily driven by Russia’s anti-western aims in the Middle East, that premise proves to be rather limited in explaining the full value of Rosneft’s most recent deals — including $3 billion in oil prepayments for cash-starved and war-stressed Kurdistan and a preliminary deal with Libya’s National Oil Corporation (NOC) to invest in Libya’s upstream, part of Libya’s national strategy to increase oil production from 700,000 barrels per day (bpd) to 2.1 million bpd by 2022. Rather shifts in Russia’s market strategy, rising production in Kazakhstan, and fears of China’s expanding Middle East influence seem better suited in explaining Rosneft’s economic rationale for its recent dealings in Kurdistan and Libya. Some of Russia’s compliance with OPEC cuts has come from extremely low temperatures and weather in Western Siberia. Russian production dips annually in Q1 and Q4 due to the winter. Numbers show that Saudi Arabia is bearing more of the cuts than the deal stipulates, with Saudi production dipping to roughly 9.75 million bpd in January. Despite this, Saudi Arabia and Angola overtook Russia as the top suppliers to the Chinese market in January. But China does not publish data on when oil was shipped and some increases may be the use of stored reserves. Russia gained more on the Japanese market but the most interesting development is a change in Ural blend’s access to Asian markets. Russian Ural blend — an export mixture of heavy sour oil from the Ural and Volga regions with lighter Western Siberian oil — gained market share in South Korea because of rising costs for OPEC supplies. Ural blend is normally traded by vessels that can transit the Suez Canal, which limits its competitiveness on Asian markets since OPEC can use larger tankers from other ports. The South Korea trades are evidence that the OPEC cuts are creating new opportunities in the East for Russian producers. But that window is limited by future declines in Western Siberian and Ural production and Rosneft’s customer base. Rosneft alone provided Europe 20 percent of its oil import needs in 2015. By investing in production in Libya and using its trading arm to ship Kurdish oil to its refineries in Germany, Rosneft can try and continue riding this most recent development as a means of increasing Ural blend’s market share in Asia while pushing back against attempts by Saudi Arabia to take a larger share of European markets. Last year, Russia launched trades of Ural blend futures on the Moscow Exchange in an attempt to decouple Ural blend’s prices from Brent crude benchmarks. Russia is stuck trading Ural blend with a discount off of the Brent benchmark. The endeavor is unlikely to succeed, but if Russia can maintain trades of the blend on Asian markets, the potential pricing power of a new benchmark would look more attractive. Last October, Kazakhstan’s Kashagan field finally came onstream. Kazakhstani production is expected to climb from around 1.3 million bpd to 1.8 million bpd as investments in Kashagan and sister field Tengiz pay off. Due to growing internal political pressures, fear of potential malign Russian actions, and a need for new export capacity, Kazakhstan has begun pushing for a Trans-Caspian oil pipeline with Azerbaijan that would connect to the Baku-Tbilisi-Ceyhan pipeline. Kazakh crude could then be sent to Ceyhan, where it could be shipped elsewhere. Kazakhstan’s exports are currently limited by reliance on pipelines running to the Russian Black Sea port of Novorossiysk, reducing their competitiveness for markets outside of Europe and the Mediterranean due to restrictions on the volume of shipping through the Bosporus strait and tanker capacity. Russia has shifted its exports towards Baltic ports in recent years, using Kazakh and Azeri crude supplies for the Black Sea basin. In 2014, roughly 90 percent of Libyan production went to European markets and this dynamic has likely not changed. As production rises in Libya, it will strain the competitiveness of Kazakhstan’s oil exports on European markets, further pressuring Kazakhstan to gamble on a Trans-Caspian pipeline that will likely incur political responses from Moscow. Kurdistan’s production also transits through Ceyhan and Kurdistan may see new investments should Rosneft’s moves encourage confidence. If the Kirkuk-Ceyhan pipeline from further south in Iraq is restored, the oil terminal at Ceyhan will be too crowded without major investment. Rosneft acquired Iraqi assets to compete with Gazprom and Lukoil when it bought out Bashneft and will directly benefit as the economic logic of expanding pipeline capacity for Central Asian crude supplies will diminish. Russia can then try and force Kazakhstan to provide yet more to the Black Sea basin, continue its shift of exports towards the Baltic and, ideally, invest in greater pipeline capacity in the Far East. These factors hinder Kazakhstan’s overtures to Azerbaijan, whose oil production is entering sustained decline. China’s expanding infrastructure investments across Eurasia pose the largest political challenge for Russia’s attempts to maintain dominance in its non-European periphery and project power further abroad. The Eastern Mediterranean and Middle East form a potential bottleneck for China’s expanding influence in Eurasia if Russia plays its cards right. Chinese shipper Cosco acquired a 51 percent stake of Greece’s port of Piraeus last August, pledging to invest another $551 million into the port through 2021. The purchase was a masterstroke in the region. China has also exploited Egypt’s hopes of attracting investment by including the Suez Canal in the One Belt, One Road initiative as Chinese firms buy or build crucial transport and import-export infrastructure across the globe. 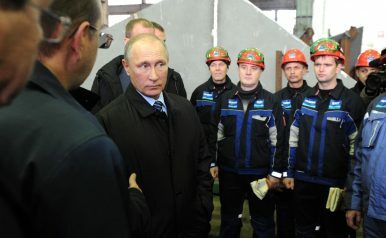 Lacking substantial financial reserves or trade, Russia has turned to the role of oil in the region’s political economy as a means of influence. In December, officials from the NOC met with Egyptian oil and gas officials in Cairo to discuss future cooperation. Rosneft is helping to midwife agreements to bring stability and further show Cairo that, after having bought into the Zohr field, Rosneft is an able partner that can deliver. Egypt prefers Haftar from his potential counterparts in Libya. The Libyan Civil War has also led to a huge expansion of illicit trade flows, which Russia will have more leeway to influence thanks to person-to-person contacts and trades via Libya’s ports. The latter gives Russia a subtler means of leveraging its considerable criminal contacts and organizations for policy ends. Rosneft may also increase the small but useful flow of tens of millions of dollars’ worth of remittances from Egyptian oil workers in Libya by helping spread oil wealth among Libyan elites. Russia has also targeted crucial grain exports to Egypt — the world’s largest grain importer — making it indispensable for the regime’s bread subsidies that feed tens of millions. The economic rationale of Rosneft’s decision goes beyond Russia’s regional ambitions, touching on Russia-OPEC oil relations, Kazakhstan’s dependency on Russian export infrastructure, and Russian attempts to have an ear in Cairo given the vital role of the Suez Canal. Prepayment decisions in Kurdistan fit into a broader market strategy that Rosneft has trumpeted for years and increase its access to oil production in Libya and Kurdistan that will serve European markets. As a result, Rosneft is likely hoping to sell Ural blend crude to Asian consumers and improve Russia’s ability to set its own pricing benchmark. These moves also help secure continued Kazakhstani dependence on Russia’s export infrastructure to the Black Sea, preserving Russia’s ability to control oil flows as a principle instrument of its foreign policy. In short, not everything hangs on snubbing Washington. Nicholas Trickett currently works at a think tank in Washington D.C. He is finishing an M.A. in Eurasian studies through the European University at St. Petersburg with a focus on energy security and Russian foreign policy. Russia’s incoherent strategy at home and abroad continues to undercut its Asian-facing initiatives such as the Eastern Economic Forum. Kazakhstan Among the Oil GiantsAmid Ukraine Crisis, Russia Pursues Energy Deals With AsiaPutin in Kyrgyzstan: A Tiny Base Expansion and a Hydropower AgreementTo Russia or Turkey? A Central Asian Migrant Worker’s Big ChoiceWhat Comes After the Caspian Sea Deal?